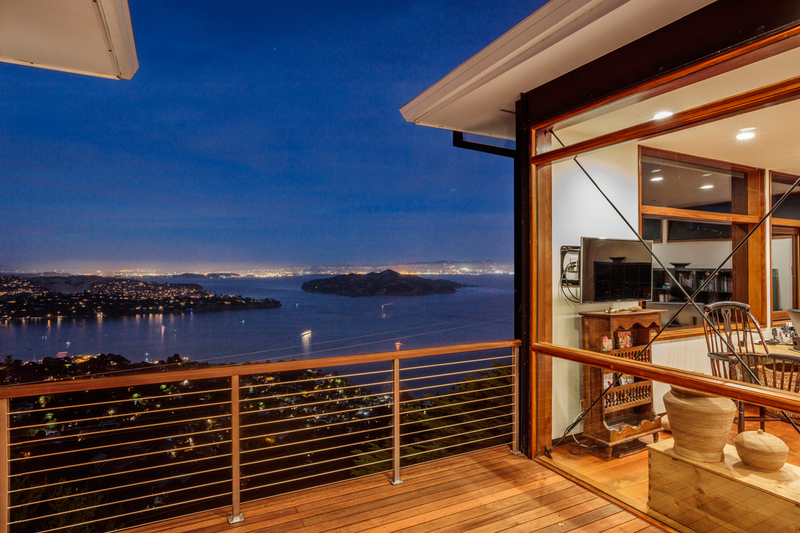 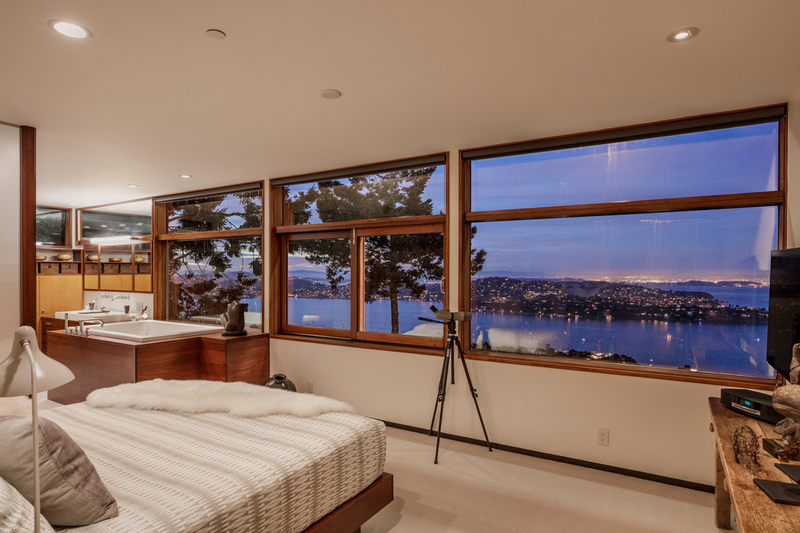 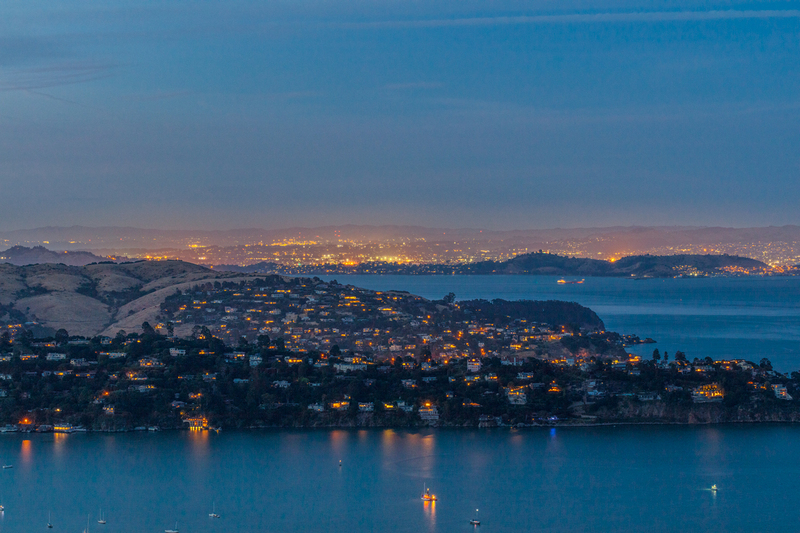 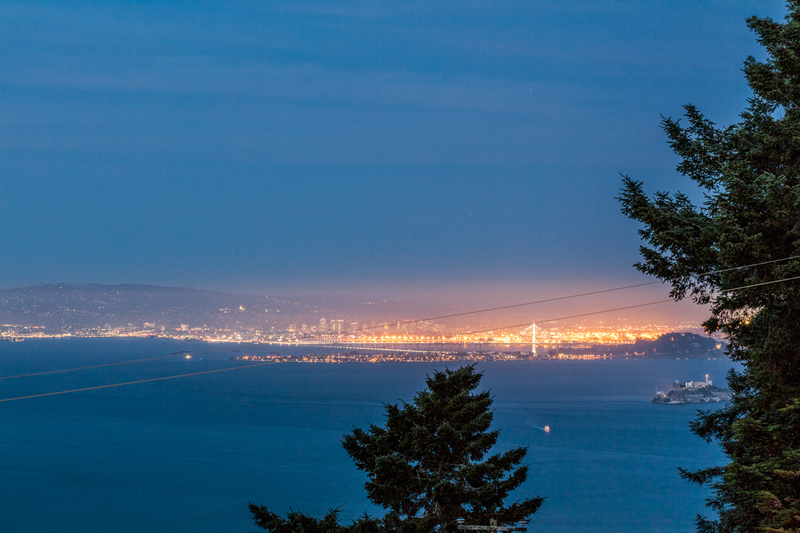 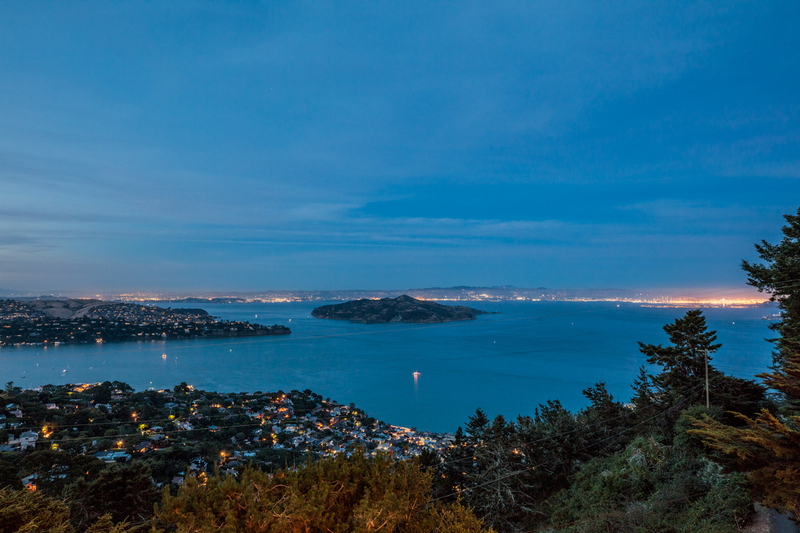 Every room in this modern masterpiece focuses on one vast, breathtaking, panoramic vista that spans the hillsides and mountain tops of eight Bay Area counties, the expanse of the San Francisco, San Pablo and Richardson Bays, the historic Angel and Alcatraz Islands, the activity across the Richmond-San Rafael Bridge, and the iconic nightly lightshow on the San Francisco-Oakland Bay Bridge. 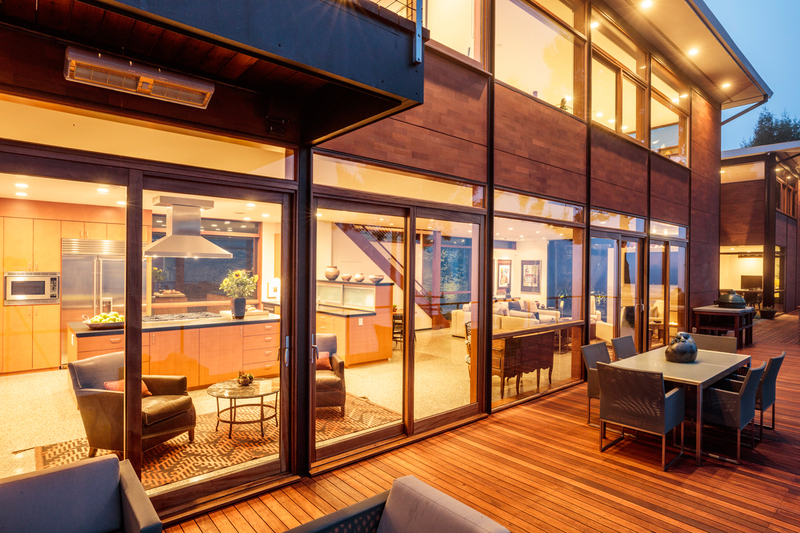 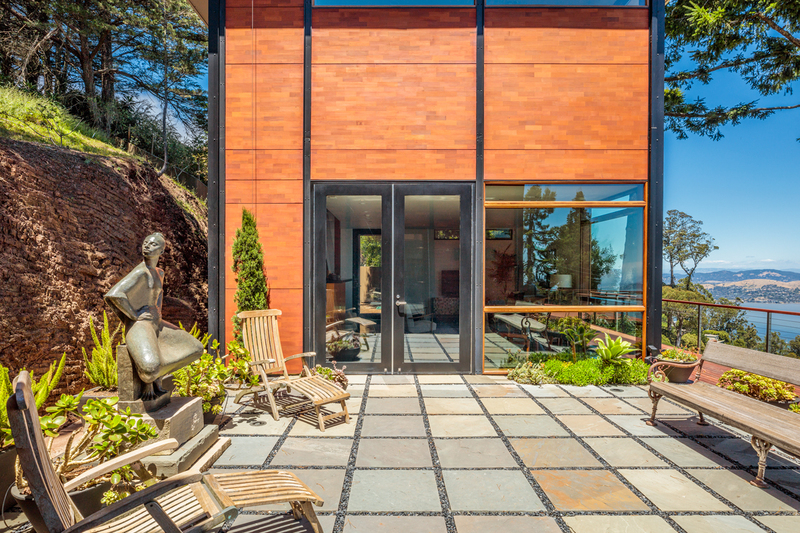 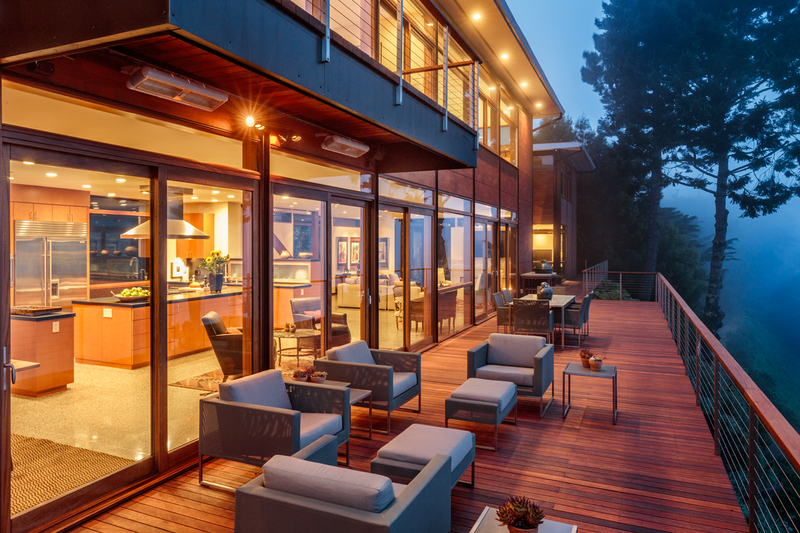 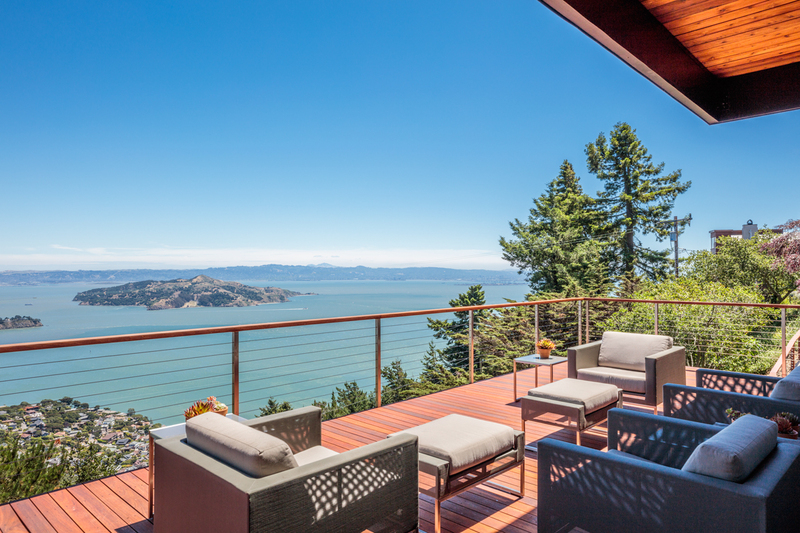 Just three minutes to the Golden Gate Bridge and San Francisco, this stunning luxury home and guest house is set nearly 1,000 feet above sea level in a wind-protected microclimate atop the Marin Headlands that offers privacy as well as out-your-door entry to the endless trails of the magnificent Golden Gate National Recreation Area. 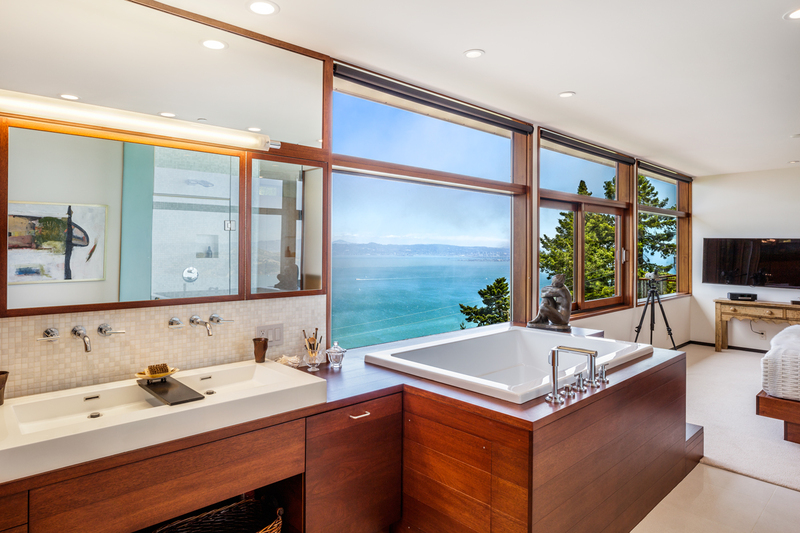 Built in 2009, this 5 bedroom - 4.5 bath - 4,611 sq. 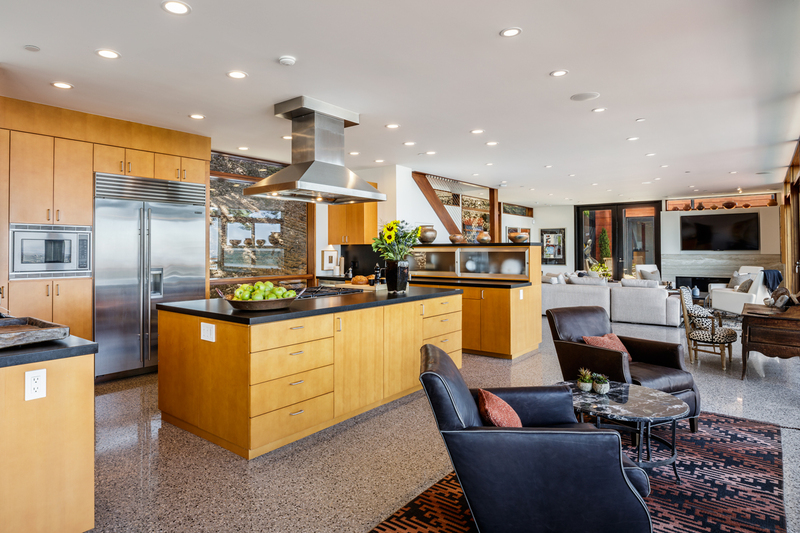 ft., streamlined “Dwell Home” recently underwent a no-expense-spared update, enriching all aspects of the already exceptional property. 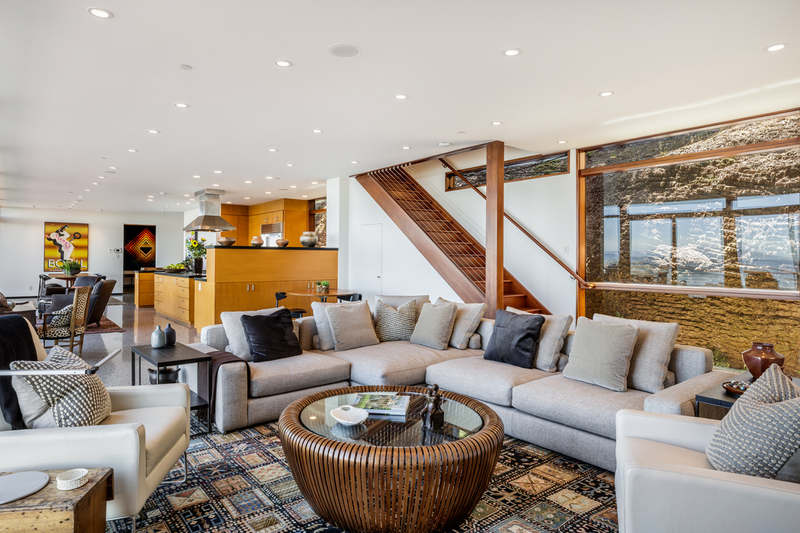 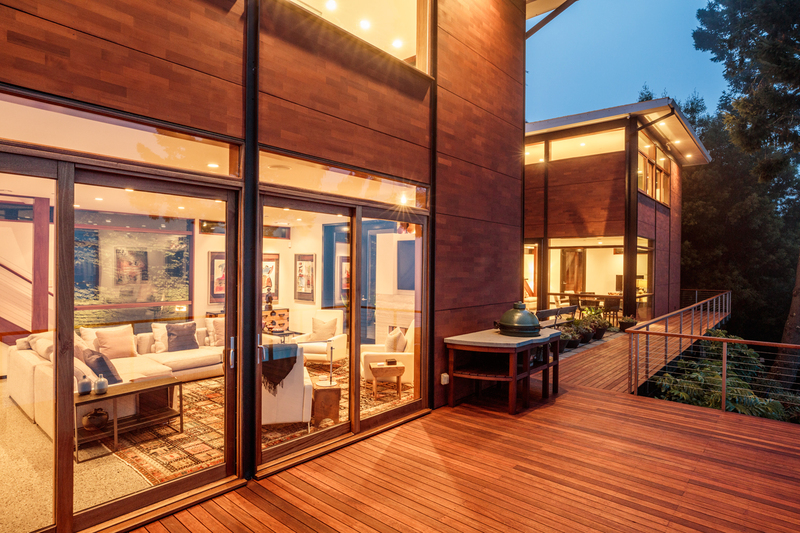 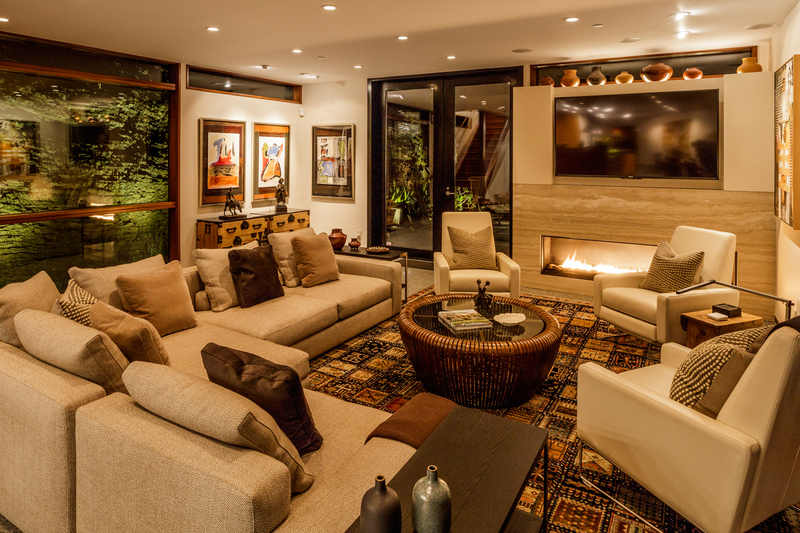 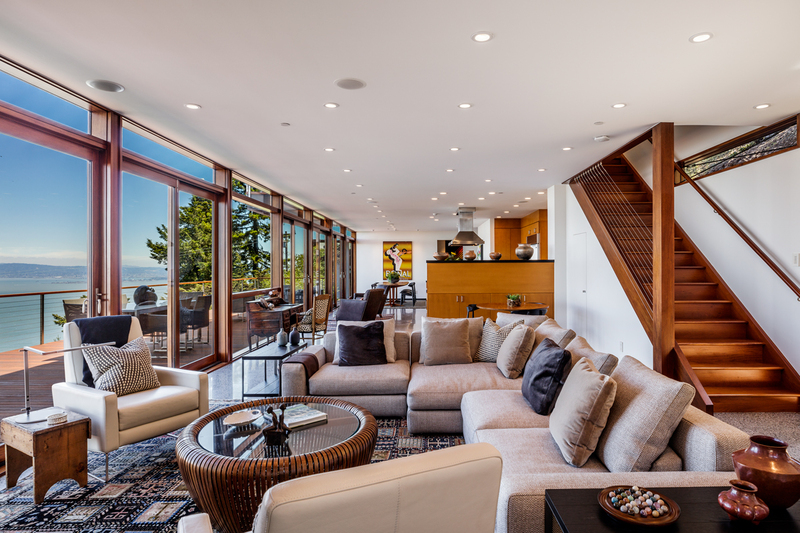 The light-filled main level features floor-to-ceiling commercial steel-and-glass piano-hinged doors, radiant-heated terrazzo flooring, and a wide, remote-controlled, “ribbon of fire“ Spark fireplace. 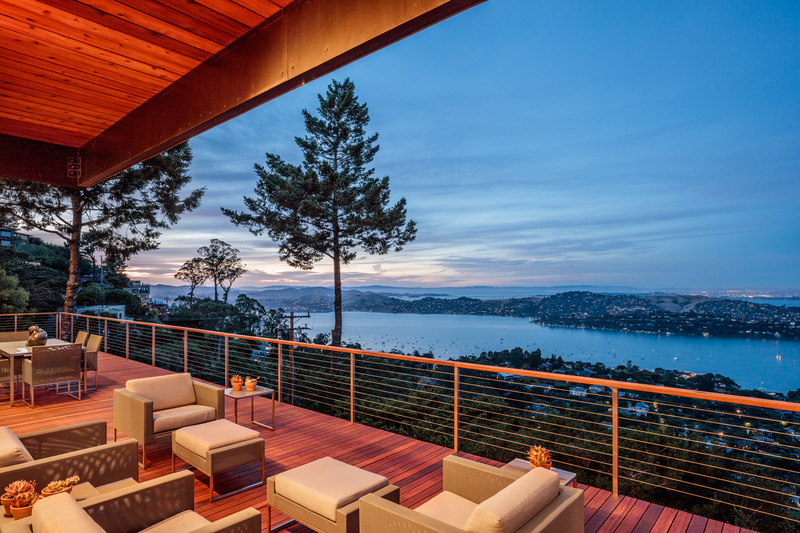 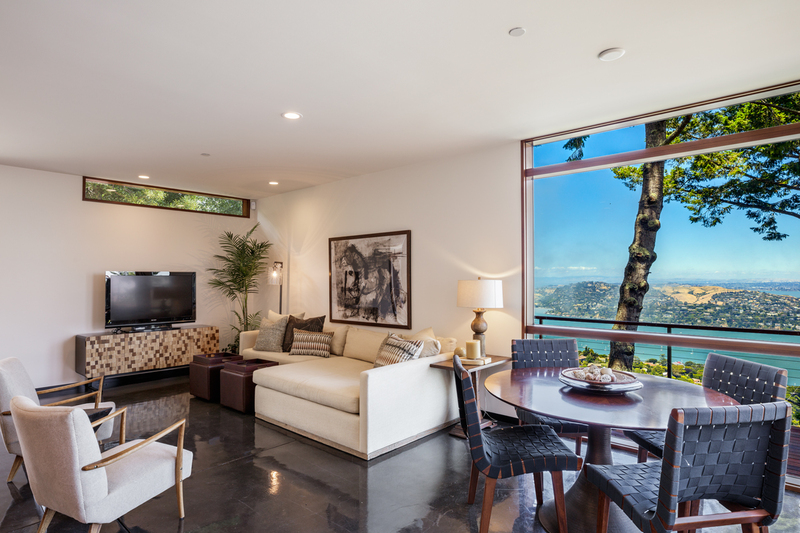 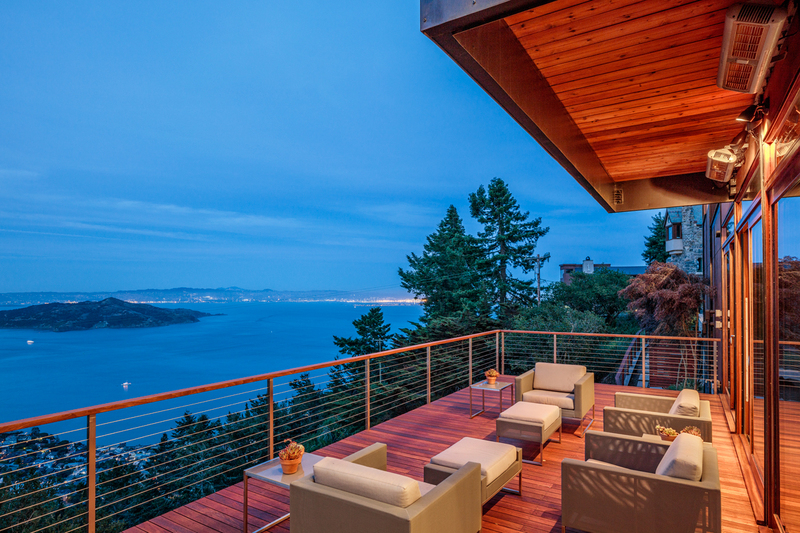 Floor-to-ceiling mahogany-trimmed windows and sliding glass doors allow unobstructed views of the panoramic vista to the east, frame sections of the magnificent undulating sedimentary chert rock wall to the west, and beckon you out onto the 65-foot deck with its heated seating area. 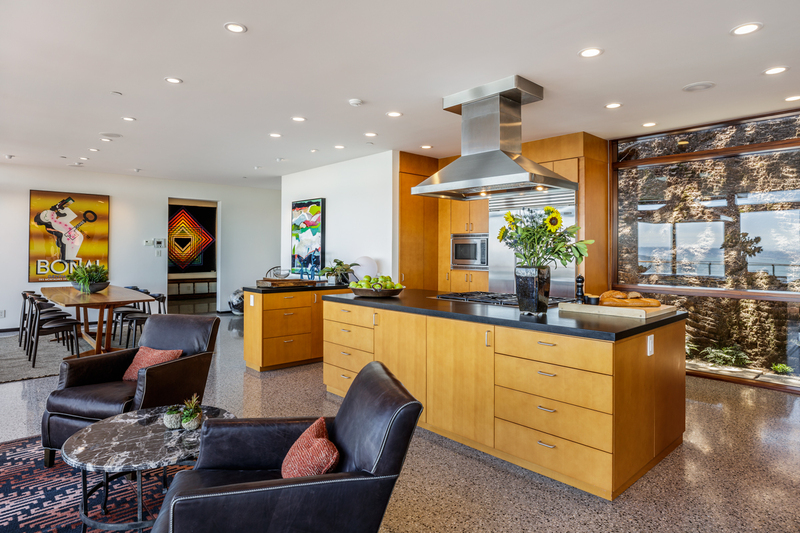 The expansive open floor plan incorporates dining, living, and family areas as well as a large chef’s kitchen outfitted with a 6-burner, 2-oven Dacor range, a Sub-Zero refrigerator, and honed absolute-black granite countertops. 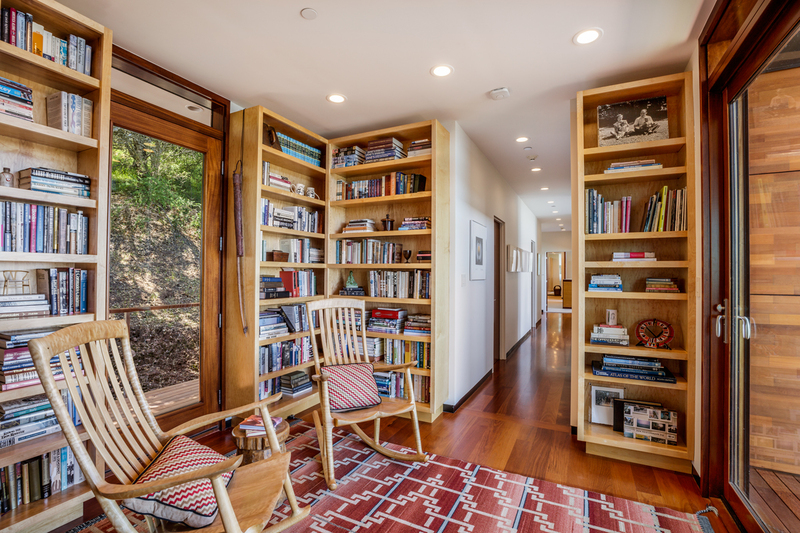 Upstairs, radiant-heated Honduran mahogany floors and appointments continue through the four bedrooms, the library, and art gallery breezeway. 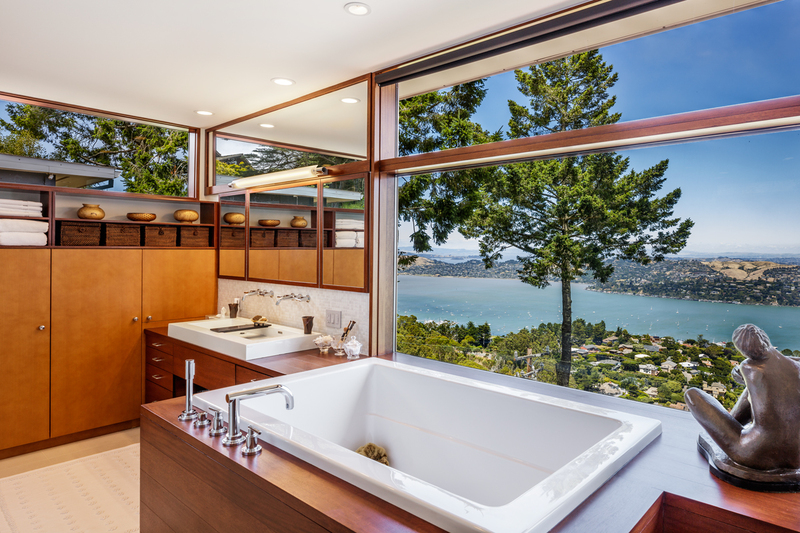 The sumptuous, open floor plan master suite offers unobstructed views from the custom-crafted platform king bed, Italian Bisazza tile steam/shower, and deep 2-person Japanese soaking tub. 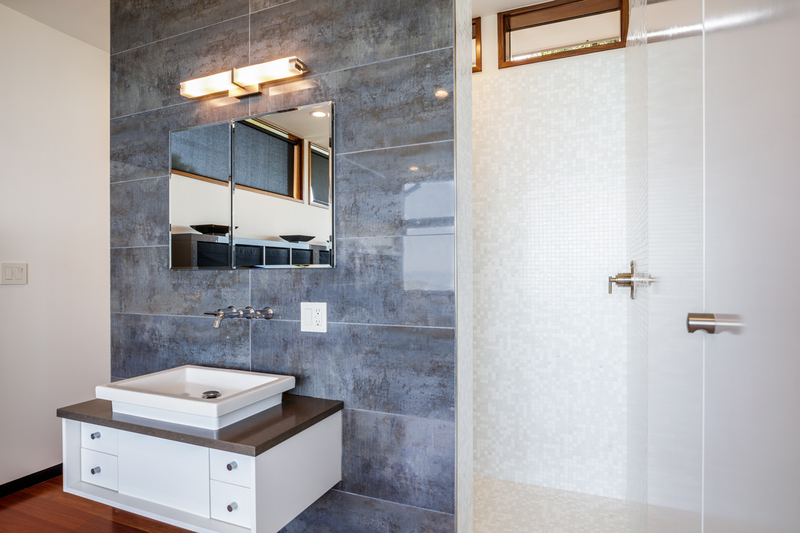 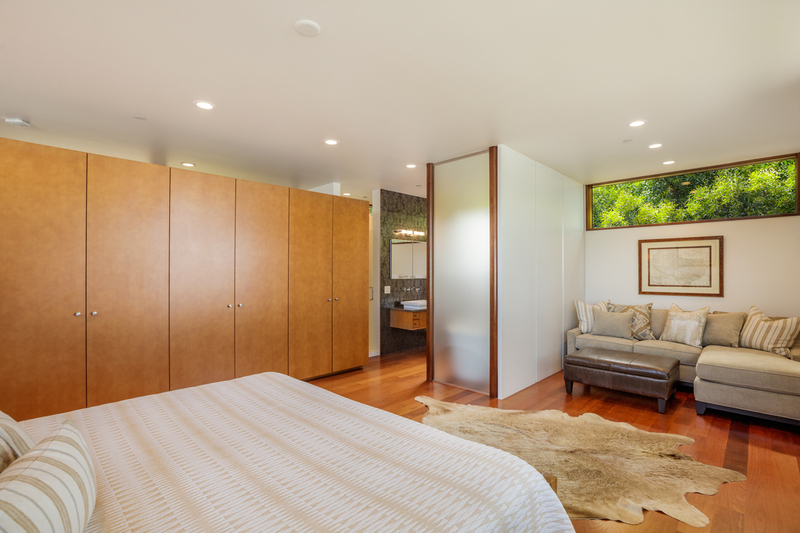 The master suite is an oasis of elegance and spaciousness, smartly appointed with a dual-sink vanity, Jacuzzi towel warming drawer, custom cabinets, and an adjoining 18-foot dressing room. 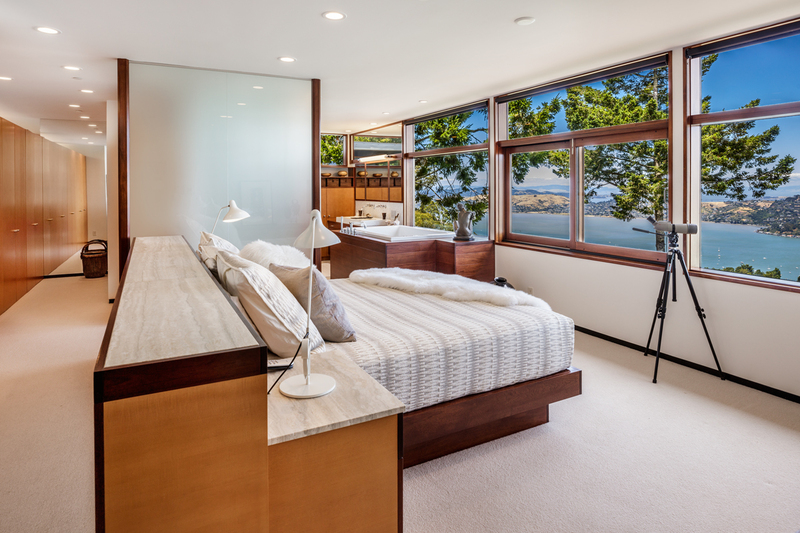 The three additional bedrooms also celebrate the view—a second master has an en-suite bath, another is home-office-ready, and the third features twin murphy beds and doubles as a workout room. 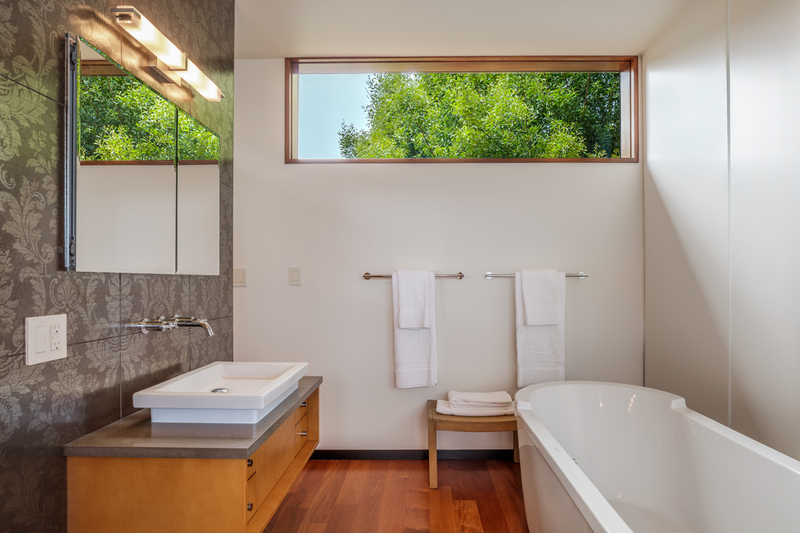 The hallway guest bathroom with large sink and dual controls, and the large laundry room with folding station and storage area, are well appointed. 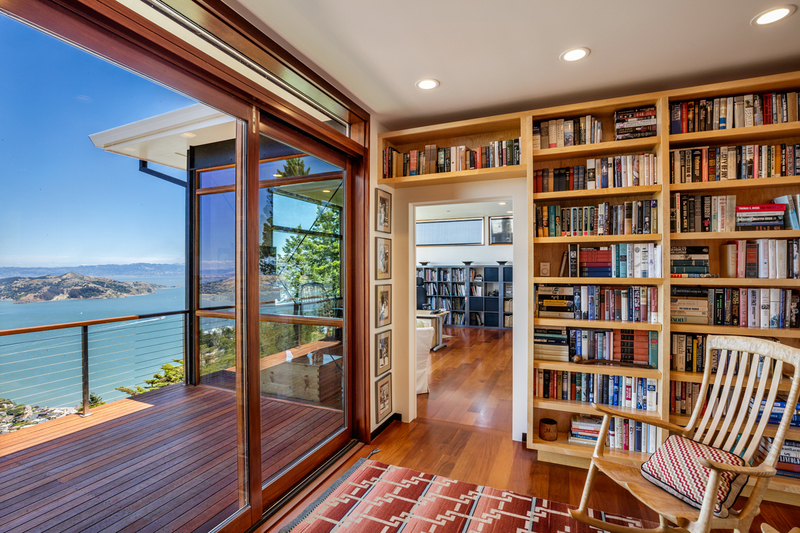 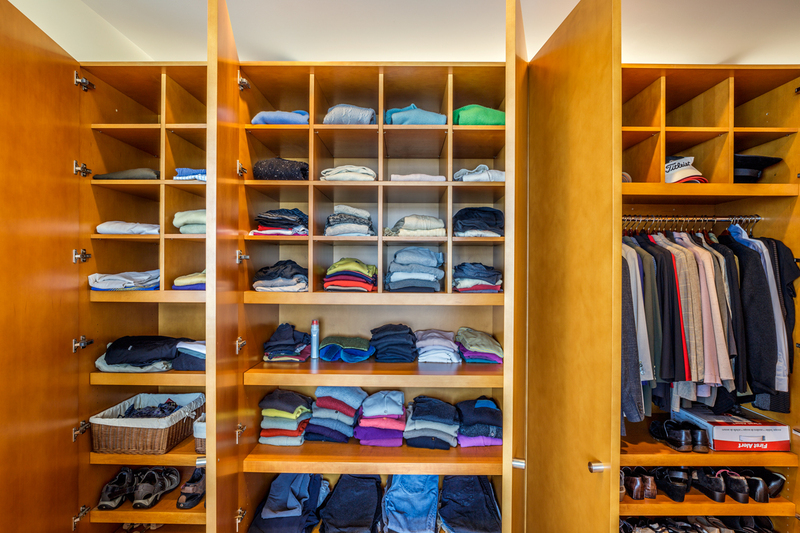 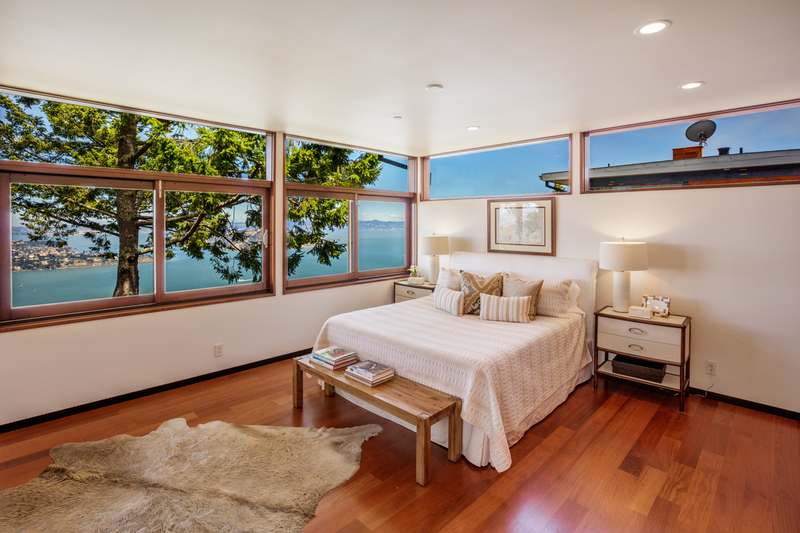 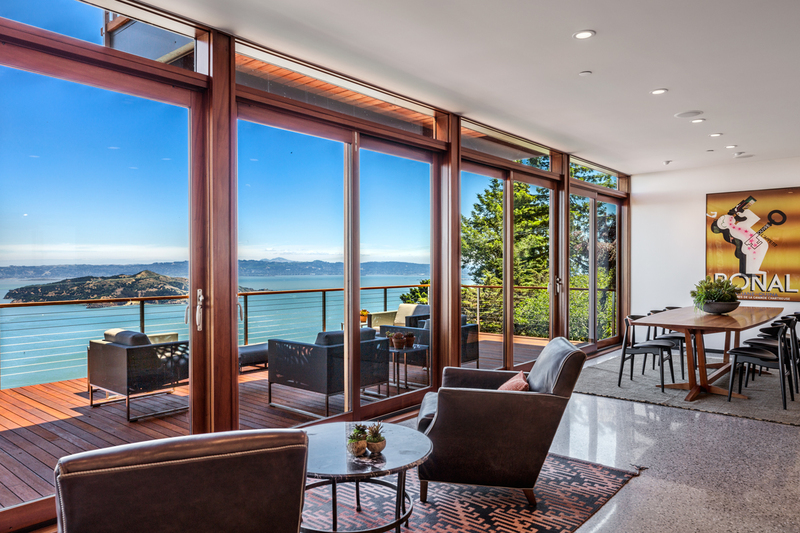 Your gateway to the second master suite is through a newly constructed library with built-in floor-to-ceiling bookshelves and view decks on either side – one offering a glimpse of the Golden Gate Bridge. 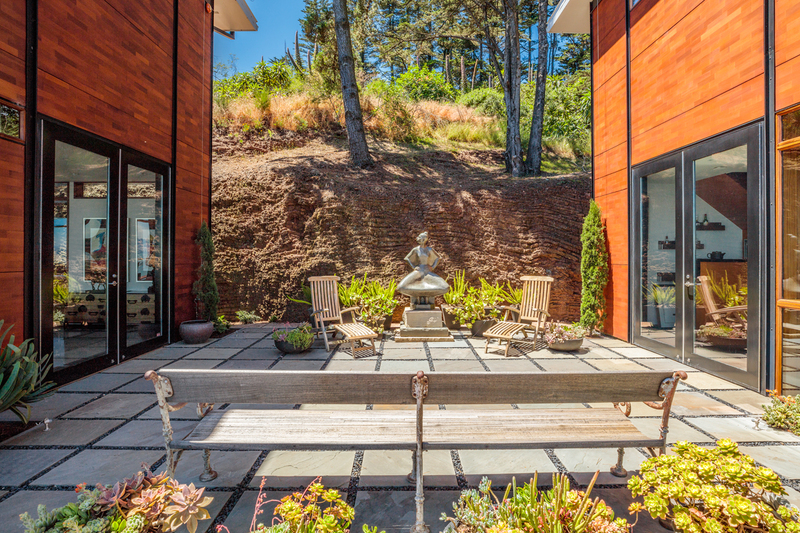 Just steps from the main house, across a blue stone garden patio, sits the handsome, two-story, 1,080 sq. 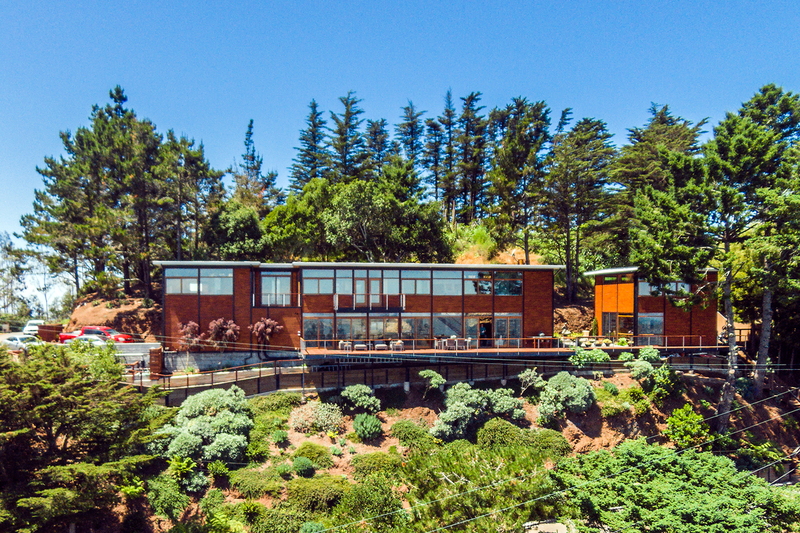 ft. guesthouse. 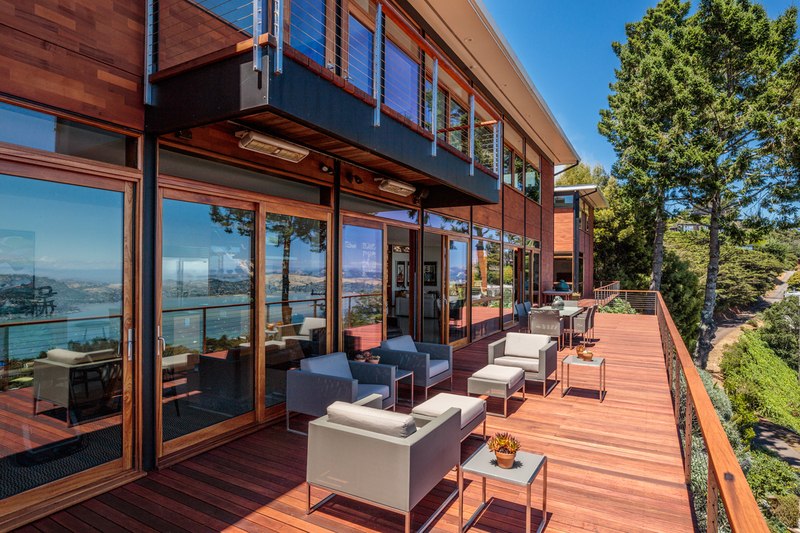 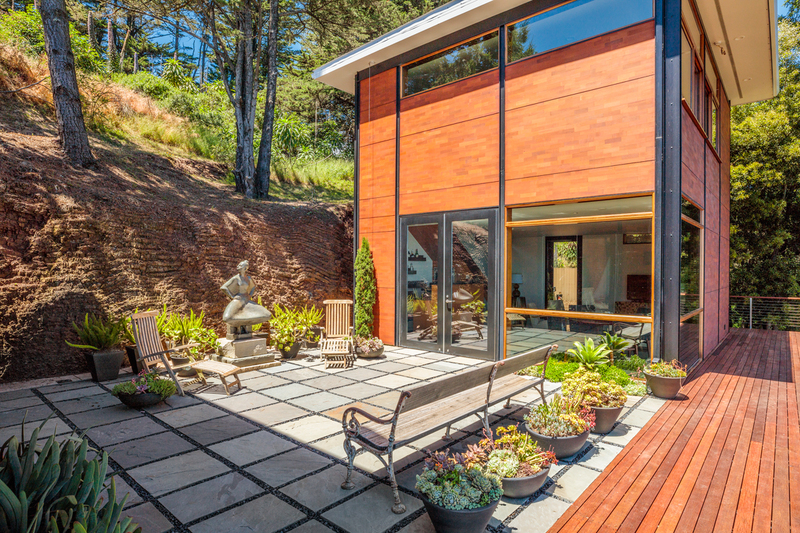 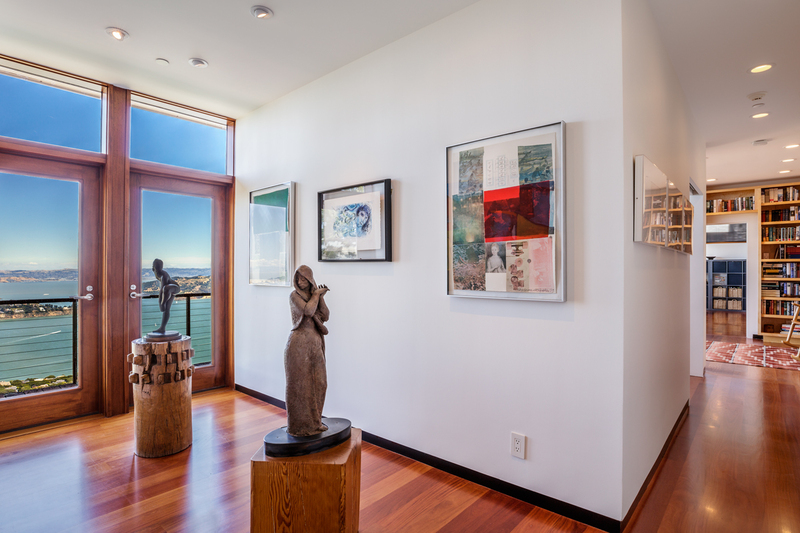 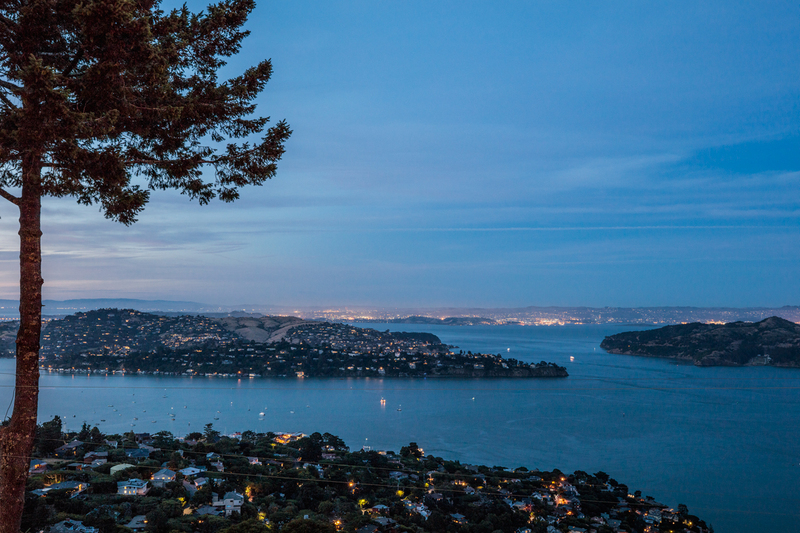 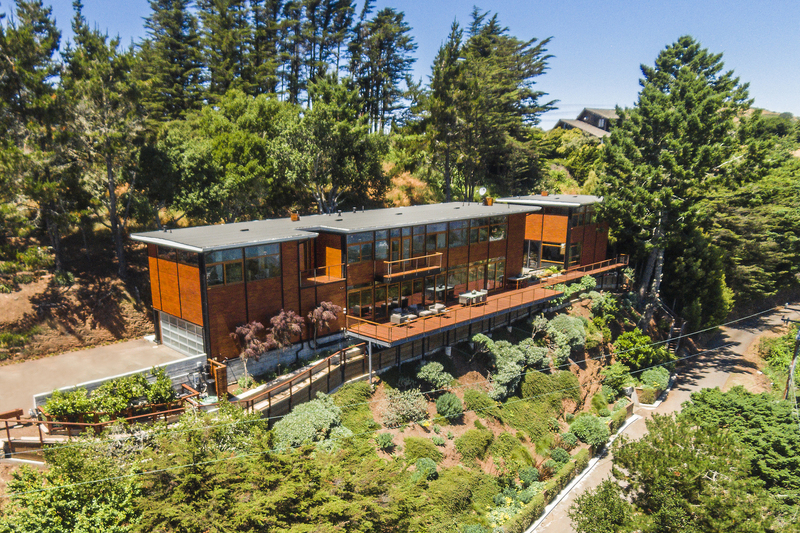 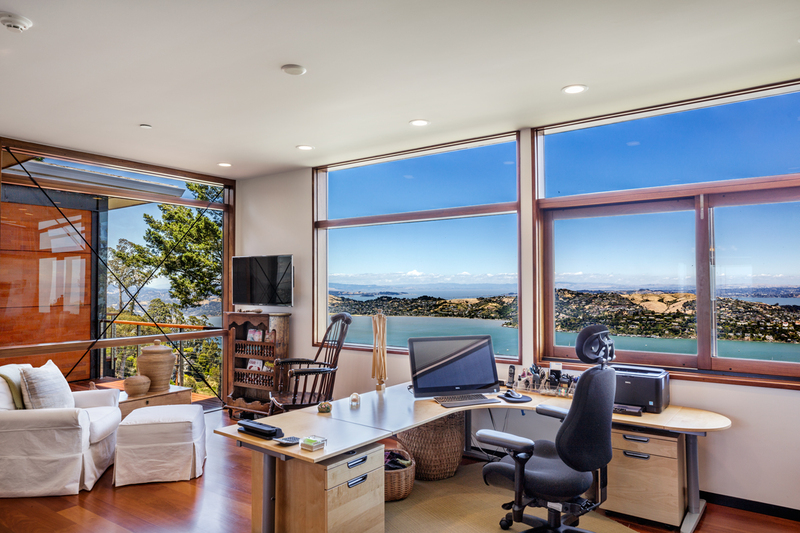 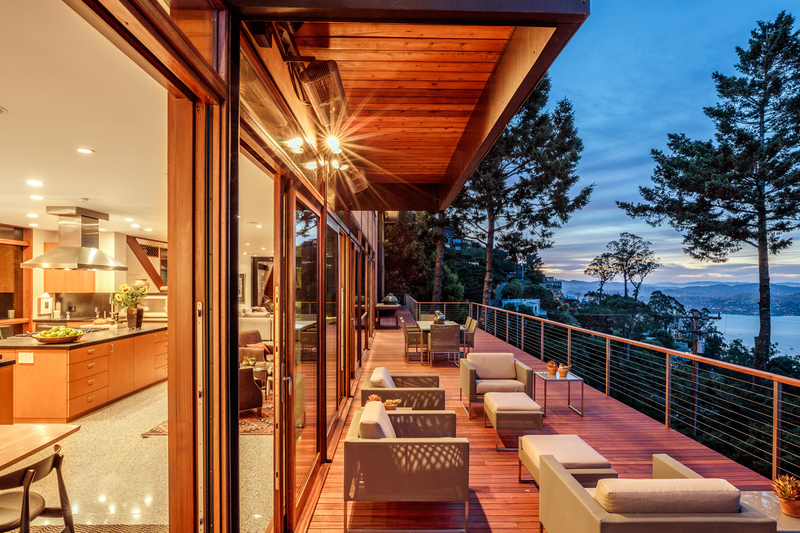 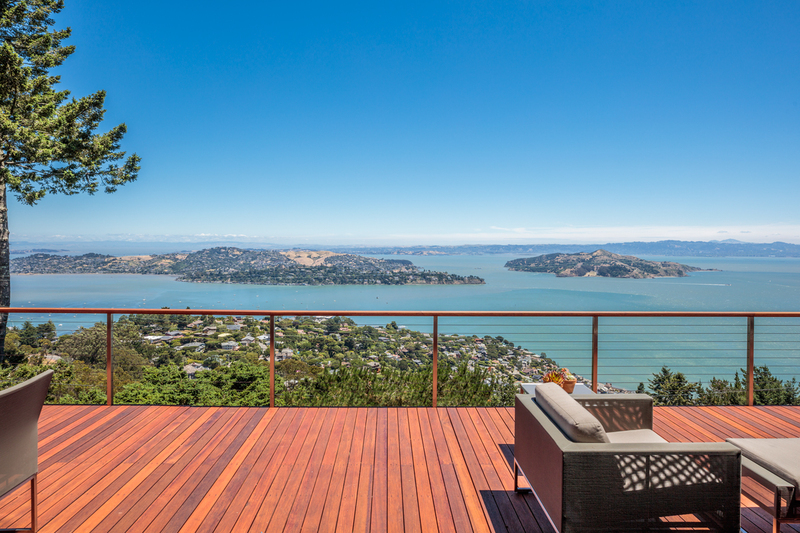 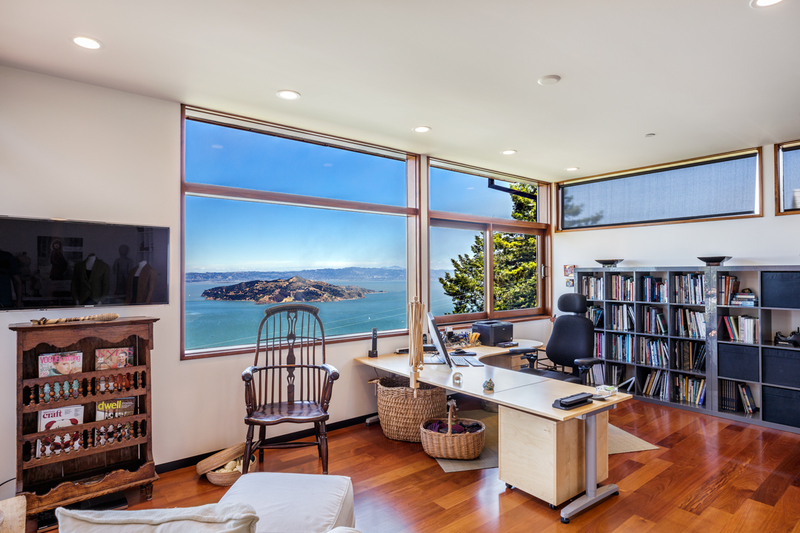 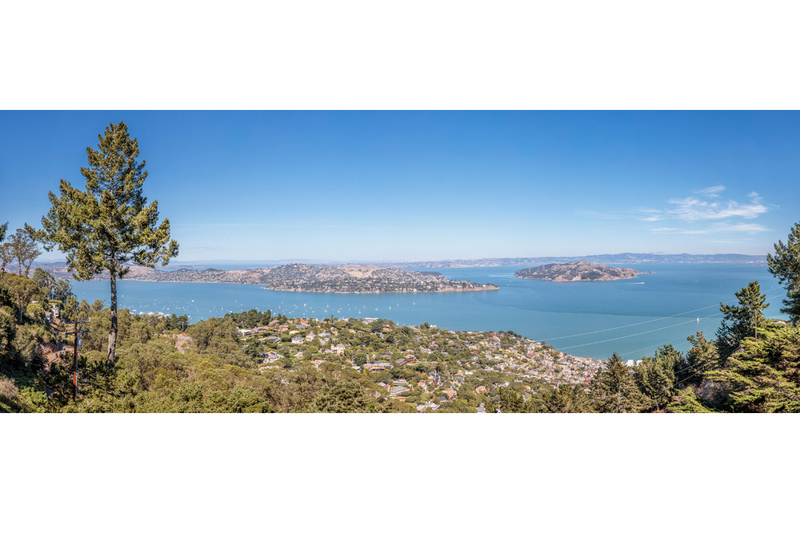 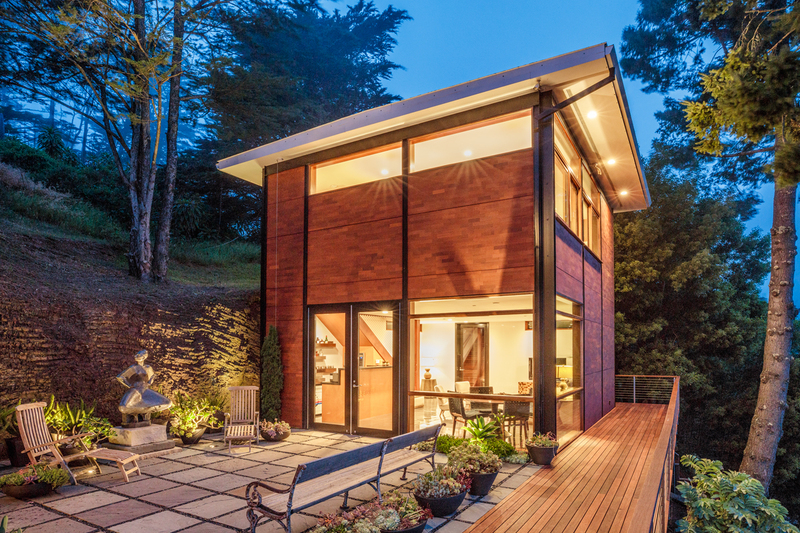 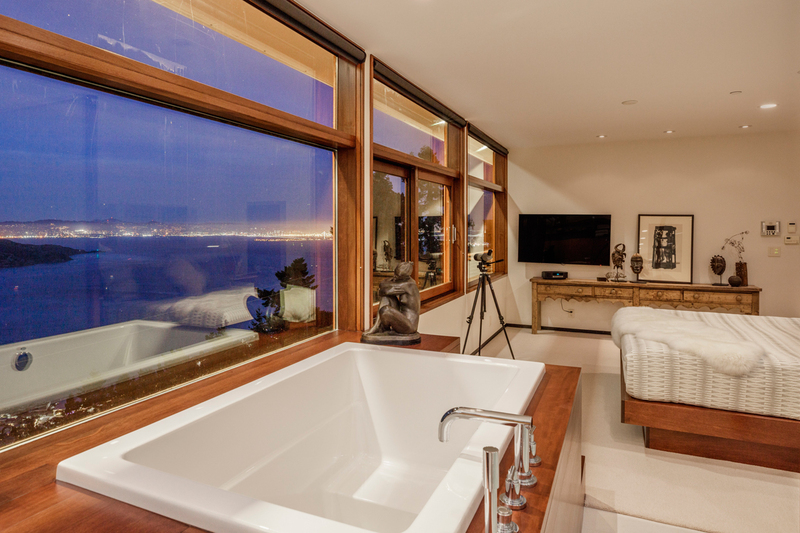 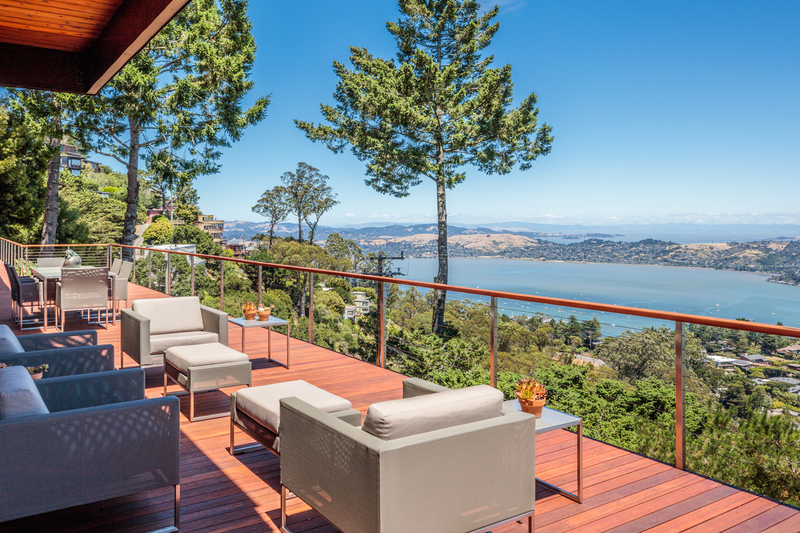 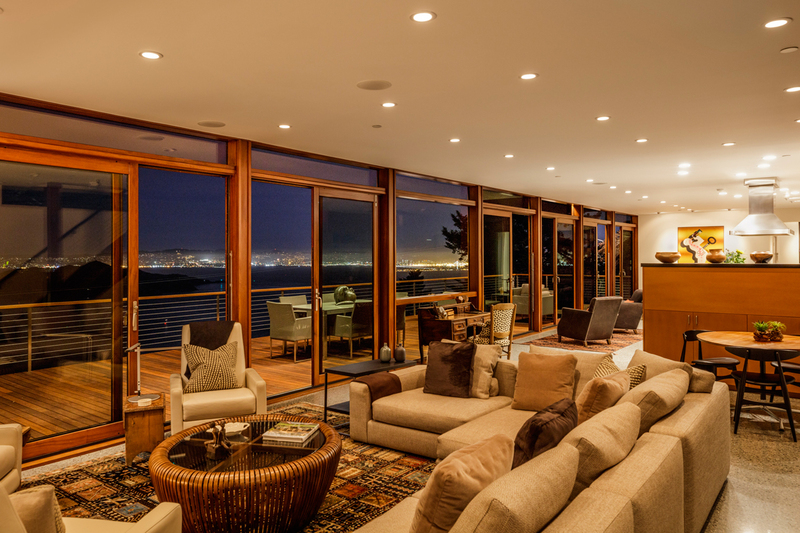 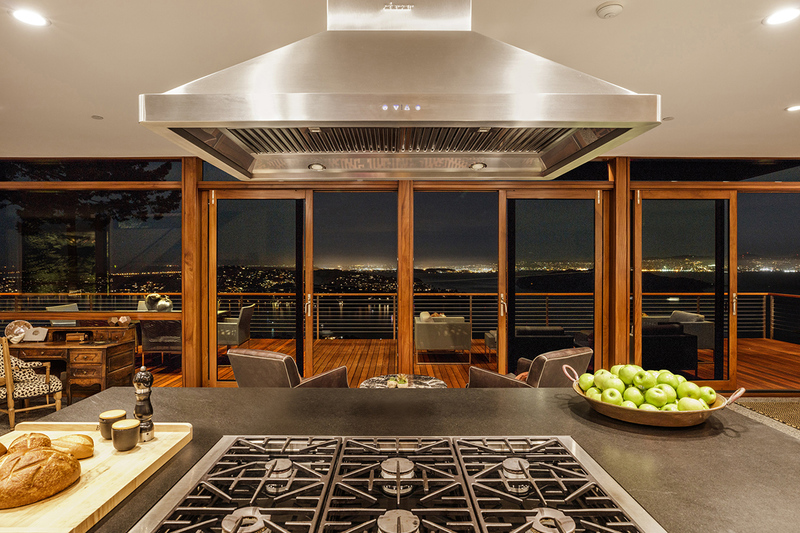 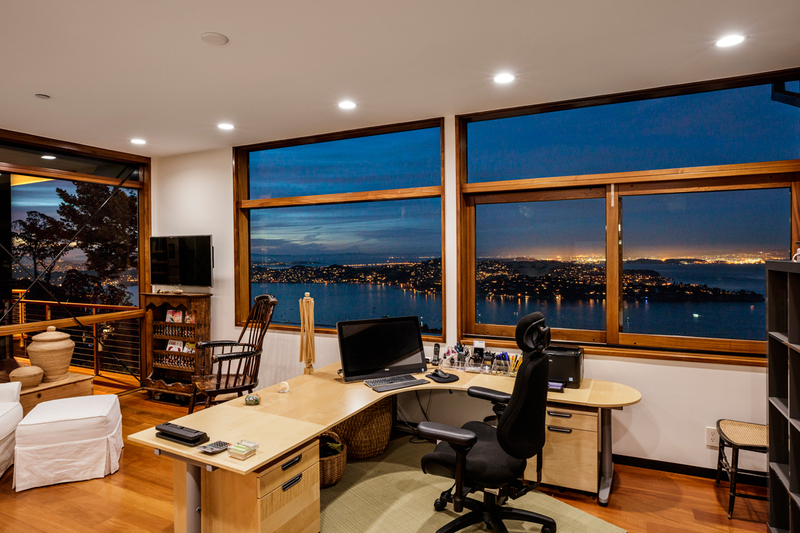 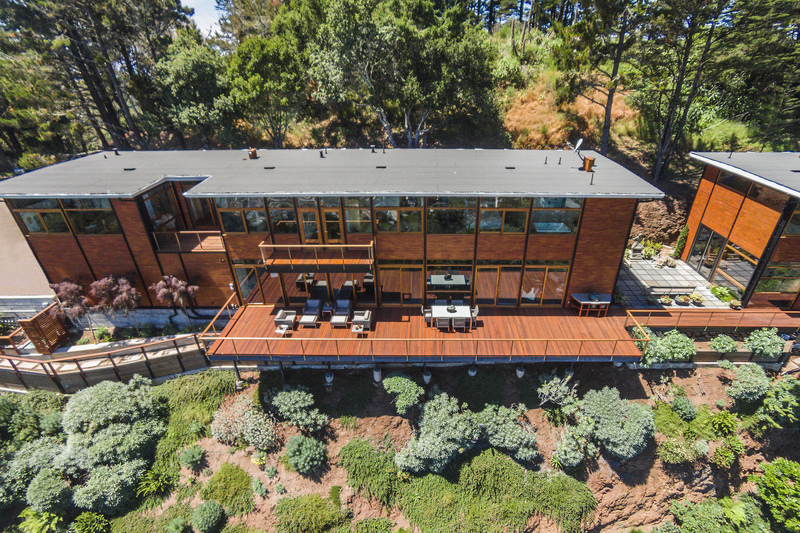 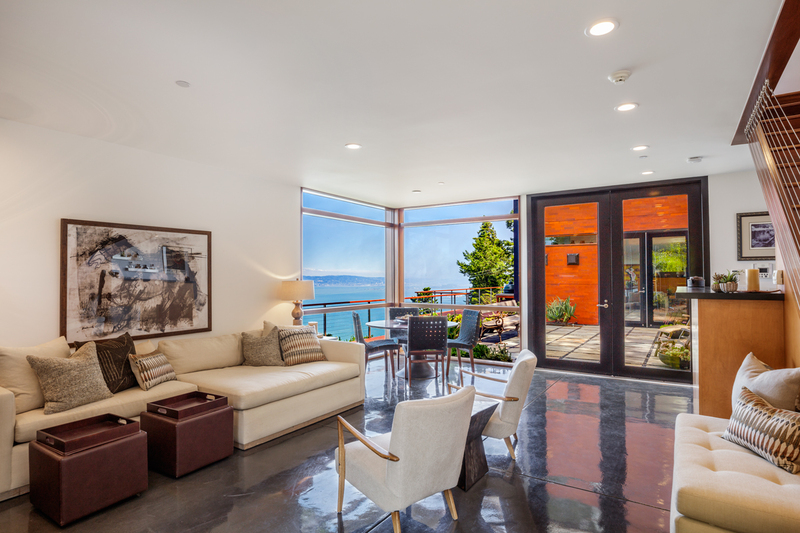 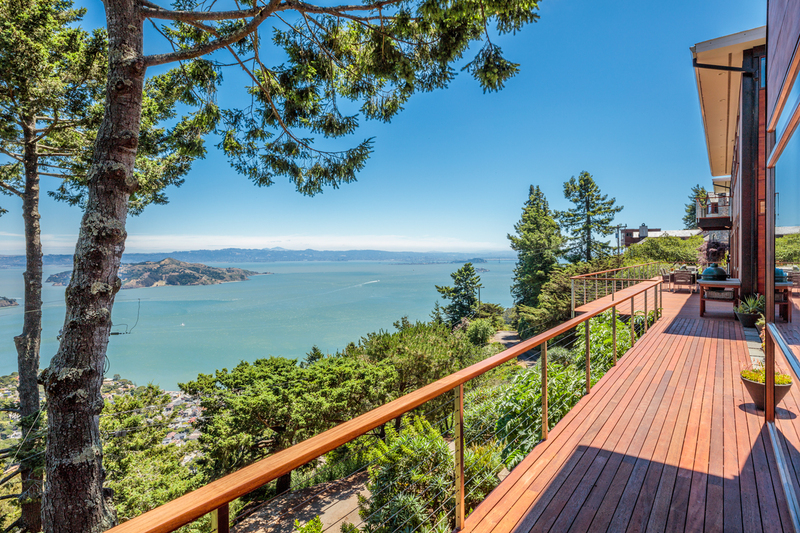 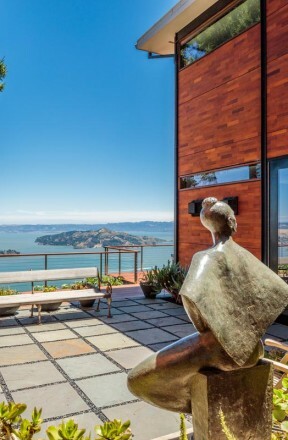 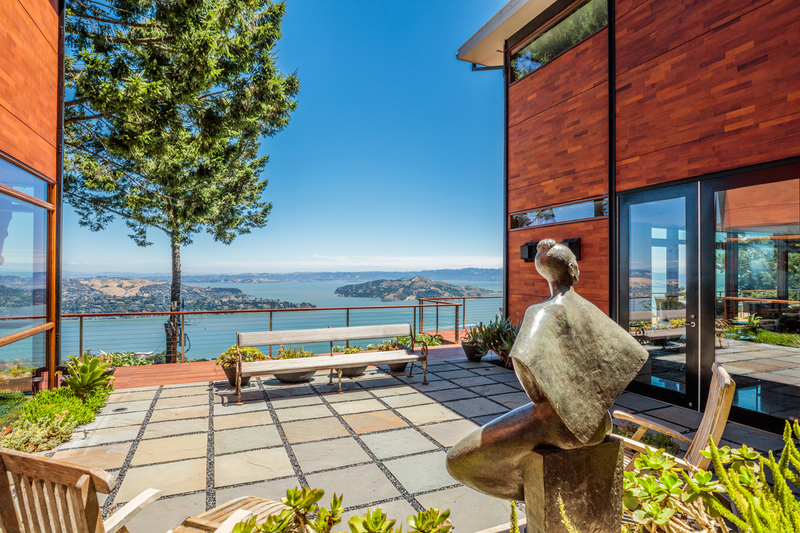 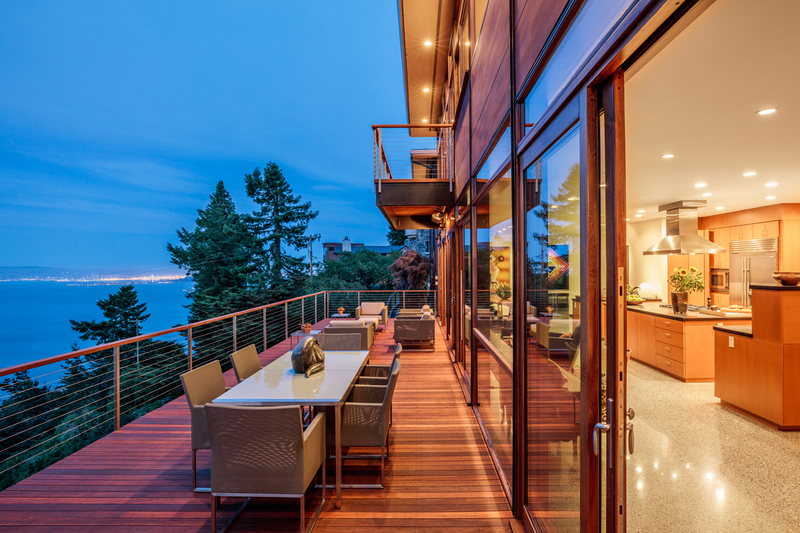 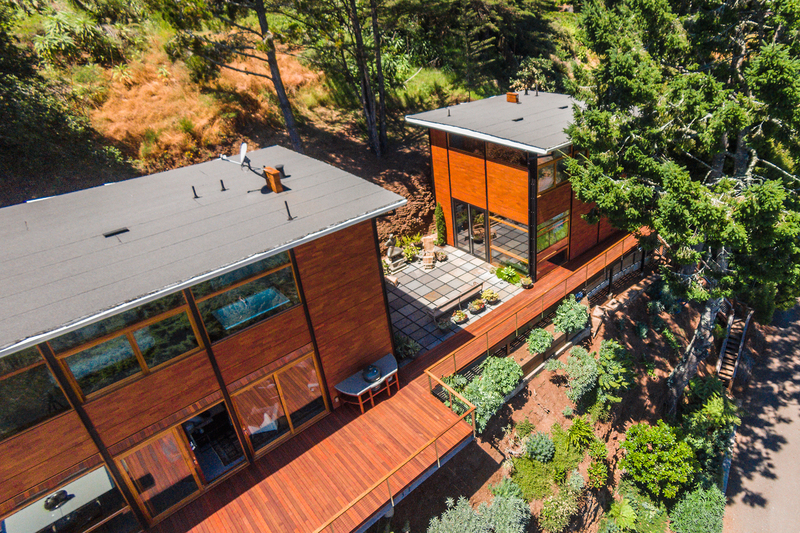 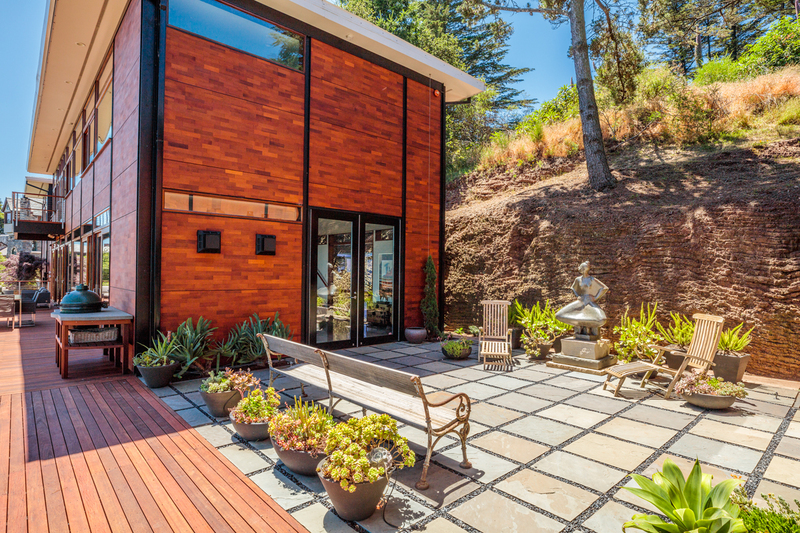 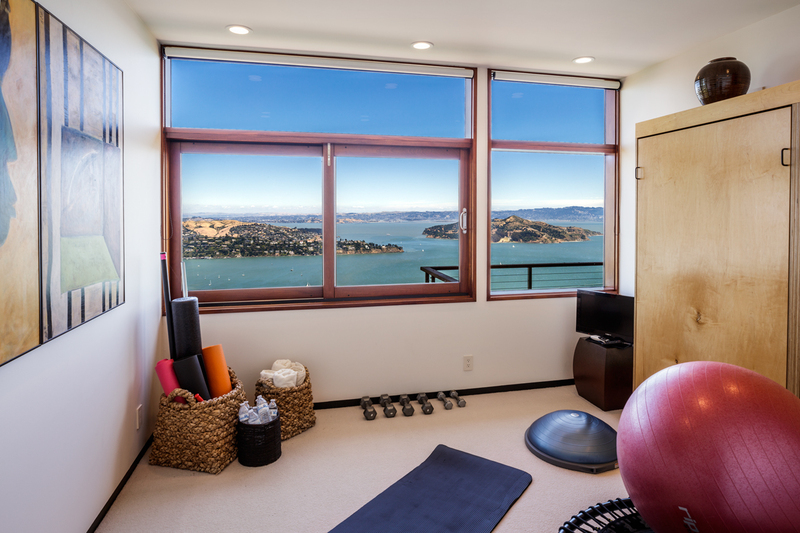 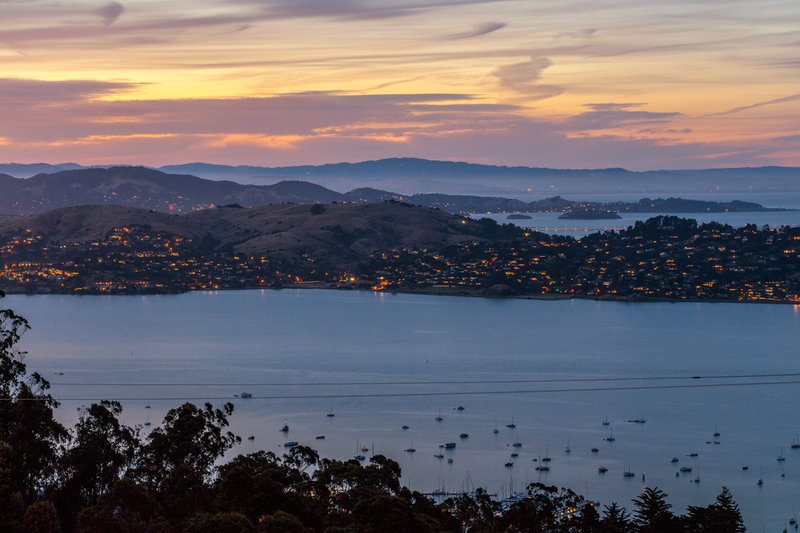 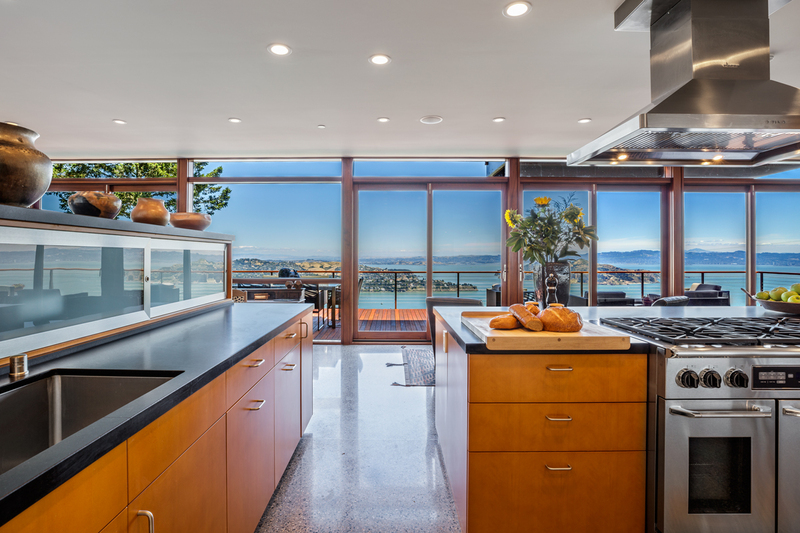 It mirrors the contemporary architectural design and appointments of the main home and shares the same panoramic San Francisco Bay Area vista. 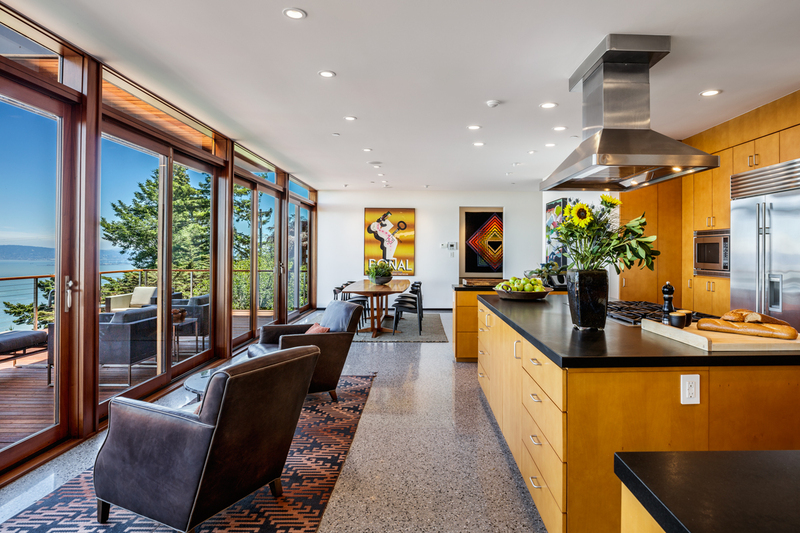 A cozy home unto itself, the first floor has radiant heated concrete floors, a bar/kitchenette area and offers ample room for living and dining. 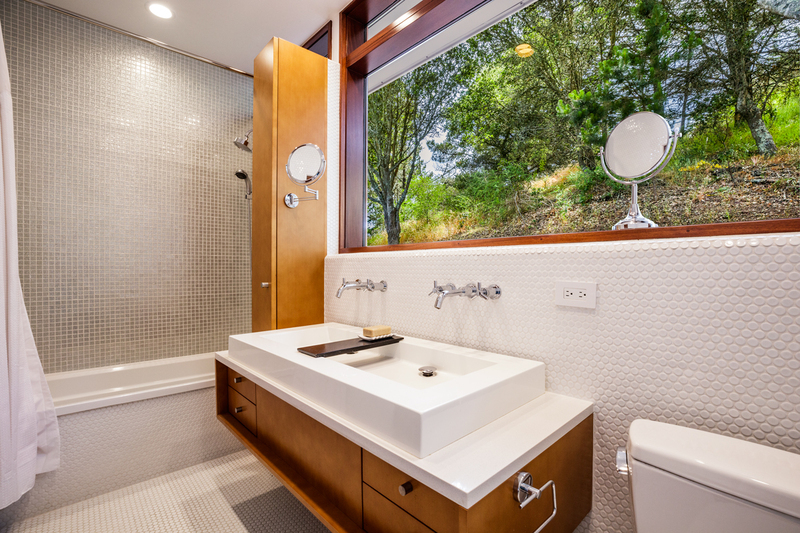 Upstairs is a full bedroom suite with radiant-heat mahogany floors, sitting area, built-in 6-door wardrobe, separate Bisazza tile floor shower with subway tile walls and a Duravit deep soaking tub. 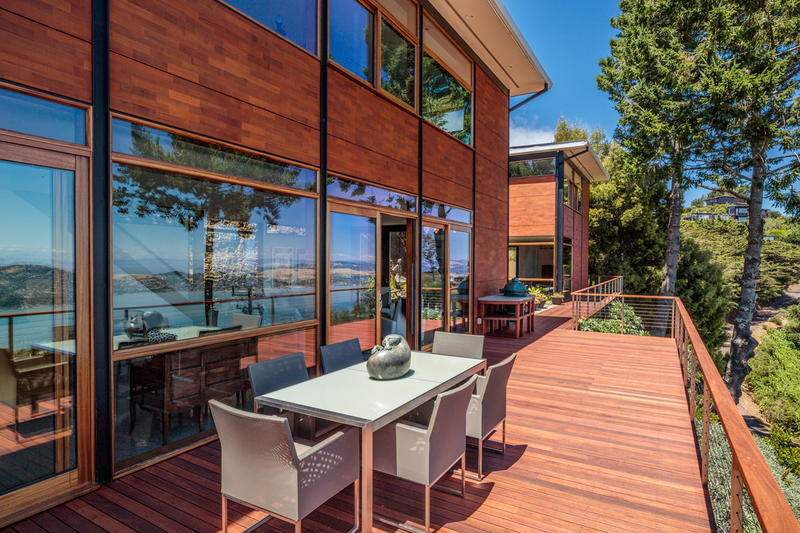 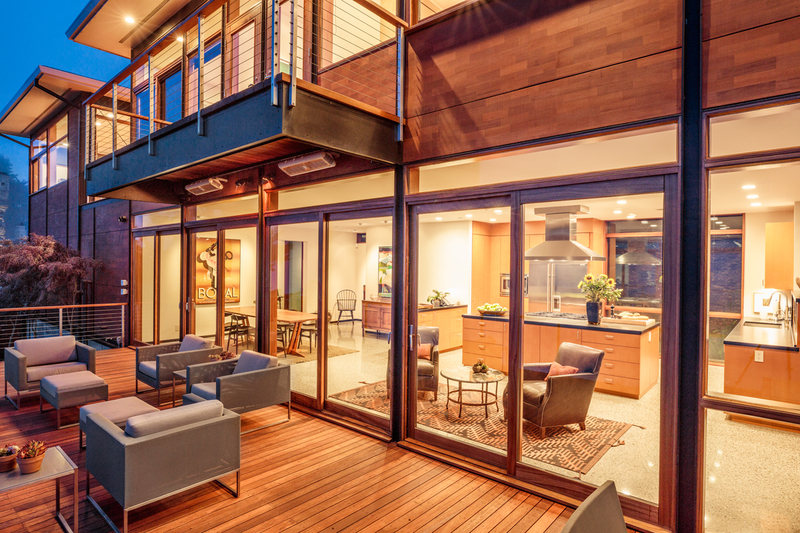 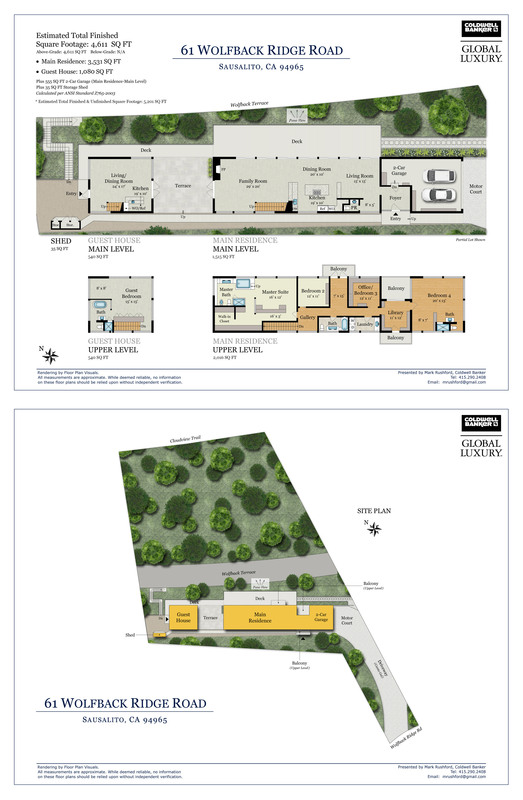 This property includes a variety of modern conveniences and smart-home features including programmed LED lighting, as well as wine storage for over 900 bottles, new landscaping with 220-foot retaining wall and native, drought-tolerant, fire-resistant plants. 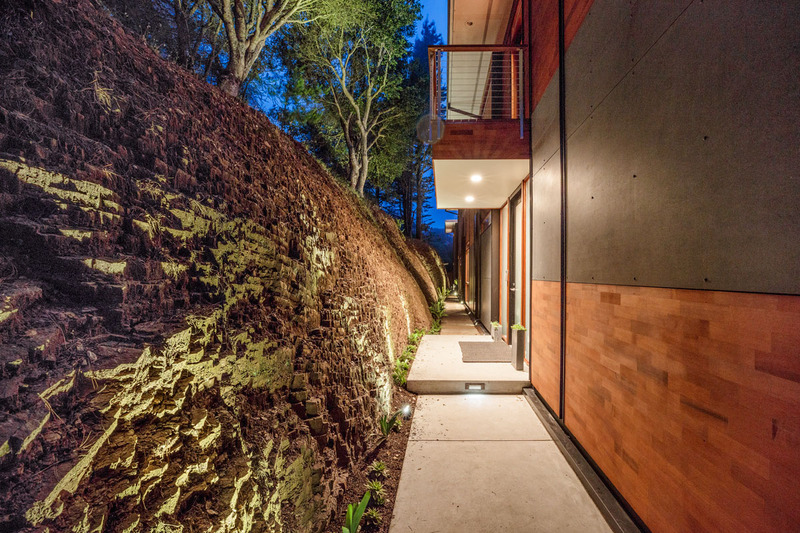 It also includes 450 feet of newly paved road leading to the home and a Tesla charging station. 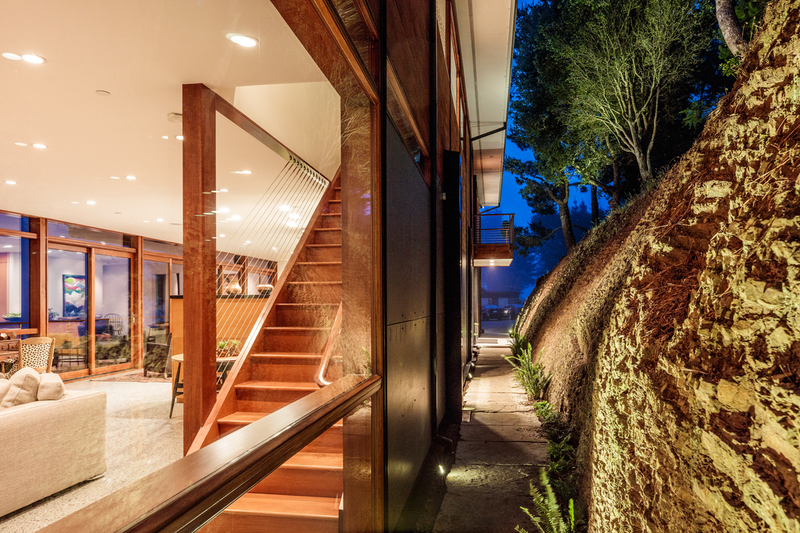 Attention to detail is evident at every turn. 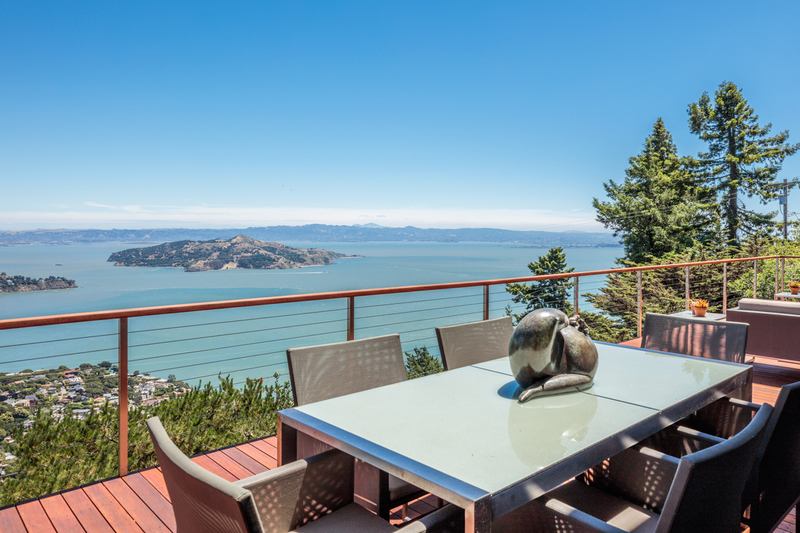 Located atop the Marin Headlands, a quick 3-minute drive from the Golden Gate Bridge and the Highway 101/Spencer Avenue Exit, this home provides the rare opportunity to live “away from it all” while having nearly traffic-free immediate access to the city of San Francisco and Sausalito’s fine restaurants, cafes, and shopping. 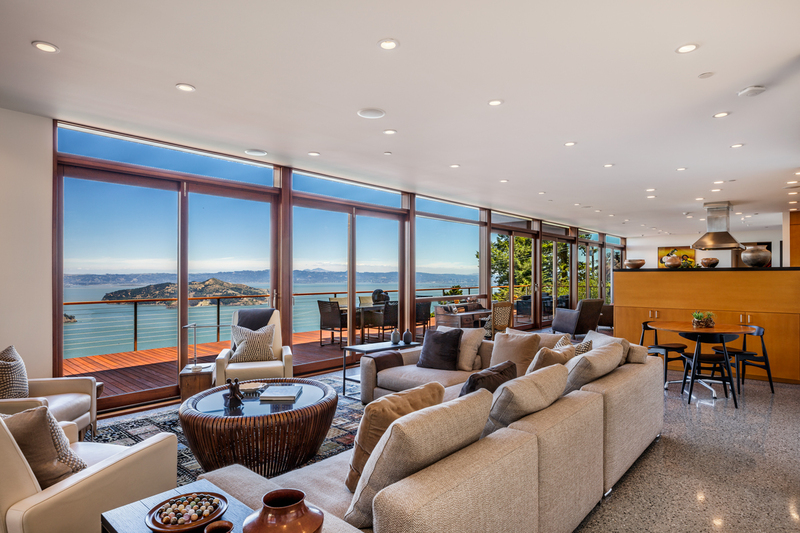 Yes, truly, you can have it all! 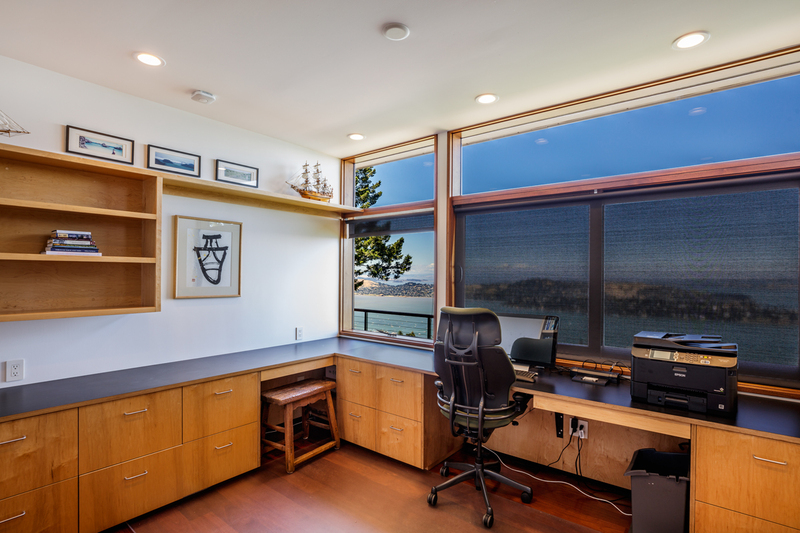 Fan cooled electrical system closet.